©Copyright, Outcalt & Johnson: Retail Strategists, LLC. All rights reserved. Amazon Books, the bricks-n-mortar bookstore Amazon opened in an upscale Seattle shopping center. In our view, what Amazon has launched is a new kind of category killer, in a specialty shop footprint. ​We have watched the opening of Amazon's first bricks-n-mortar specialty store with great interest. And here is our conclusion: Brace yourself! Amazon continues to flaunt their ability to disrupt retailing. And now, they will reinvent shopping centers. For 20+ years, Amazon has been collecting incredible customer data in all merchandise categories, from apparel to electronics, sporting goods, kitchenware, jewelry, hunting gear or whatever. That database represents an enormous competitive advantage. It is empowering. Amazon is now exploiting their vast customer database to open and operate highly cost-effective bricks-n-mortar stores. The first test: Amazon Books, their just-opened bookstore in Seattle. 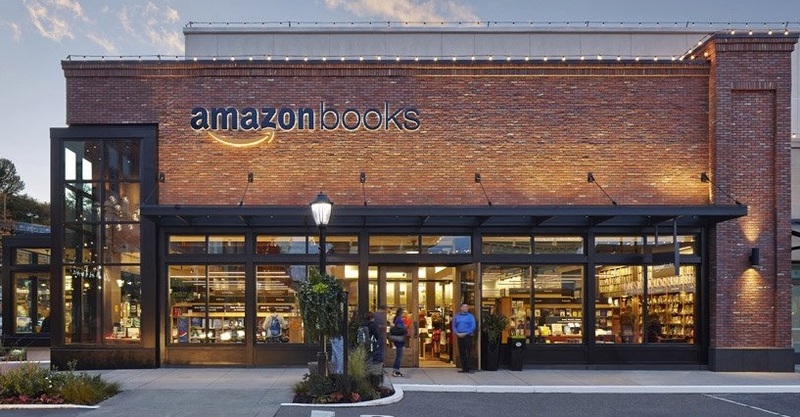 In early November, prominently located in an upscale shopping center in Seattle, Amazon opened the "real wooden doors" on Amazon Books, its first bricks-n-mortar bookstore. But, Amazon Books has far more in common with Amazon.com than with any bricks-n-mortar store. First, it is VERY data-centric. The books they carry, Amazon says, "are selected based on Amazon.com customer ratings, pre-orders, sales, popularity on Goodreads, and our curators' assessments." They are constantly gathering more customer data. No prices are displayed at Amazon Books. Want to know the price? Just scan the barcode below each book. Be sure to do so with your Amazon app; for convenience, you know. This is just the beginning. We anticipate an onslaught of entire shopping centers of Amazon "specialty retail shops". Each shop would be specifically tailored and merchandised to the customers in that particular market. In our view, what they have launched is a new kind of category killer in a specialty shop footprint. They are using their vast storehouse of data to cherry pick only the best turning inventory, to a targeted, localized market. They have the pricing advantages that come from size. They are "earth's biggest bookstore", after all. Their pricing is dynamic; e.g., $16.25 today, $17.85 tomorrow. What will it be next week? Or this afternoon? That's the marketplace dynamics in action, all at internet speed. It continues Amazon's relentless pursuit to turn "the art of retailing into the science of retailing." No more need for judgment calls, good or bad, from those high-salaried buyers; just follow the data! Much more cost effective - and predictable. And, it's true; they do not take cash! Handling cash is another demanding cost of "doing retail" that Amazon has elected to avoid. Sporting goods stores would feature hunting and fishing gear in some places; hiking and backpacking gear in another market. Their Zappos Shoe Stores would feature size ranges and styles catering specifically to each locale's customers. Breath taking, isn't it? But that is our prediction: "Earth's Biggest Store" will find you and others who shop like you (or your customers and others who shop like them) and set up its own centers of specialty shops. The power of customer data unleashed.